Discussion in 'The Pub' started by mango, May 10, 2016. How do you deal with the bastids ? Venus Flytraps - lot's of them. Stay indoors for 3 weeks or until they're gone, whichever comes first. I just successfully did this op. Those little fighter jets they call deerflys are much much worse. Small electronic wall plug-in sonic deterrent. Small black flies (bigger than gnats, smaller than houseflies) used to inhabit our basement whenever our dehumidifier would collect water. 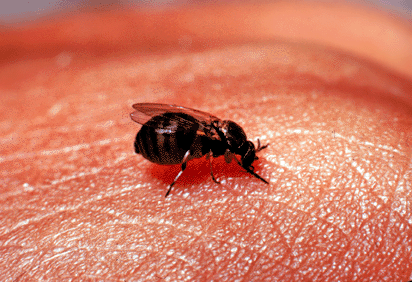 The electronic deterrent puts out a high frequency above human hearing the flies can't stand. Result? No small black flies. The electronic device is branded under the "Rid Tech" name. Not the least expensive, but does the job well. Own one in my basement music room, and just purchased 3 additional units because family will need at least one other for the kitchen this summer when carpenter ants make their usual forays into our kitchen after summer rains. The two additional units will be brought with me to my new apartment for the same reason. These devices do well for repelling not only small crawling and flying insects, but also repel mice. HeyMrTeleMan, Blix and Judge Smails like this. In southern New England, we call them blackflies or gnats. This year they are particularly bad, maybe because of last years harsh and long winter, there were very few. pickaguitar, your blackflies must be different than ours, because you could kill 150 a minute, 24-7, and they would still swarm you while outdoors. They also stay outdoors. If a few come in, they will spend the rest of their lives on a window, trying to get out. They love to bite you on the back of your arms, legs and neck. They fly in your eyes and ears, and if your mouth is open, down your throat. I dread mowing the lawn and weed whacking right now. blackflies, ticks and mosquitoes. the devil's trident! And Chiggers are Chopped Liver?